Whether you have carpet, tile, or both, it is important to vacuum your home’s flooring on a regular basis. Anything your shoes have touched can find its way to your floor. This surface is also a popular spot for crumbs, spills, and even insects. Regular vacuuming will remove the dirt and debris that get tracked into your home on a daily basis. You can also get rid of pet hair, allergens, and other unwanted particles that get pushed deep down into carpet and around tile by vacuuming often. 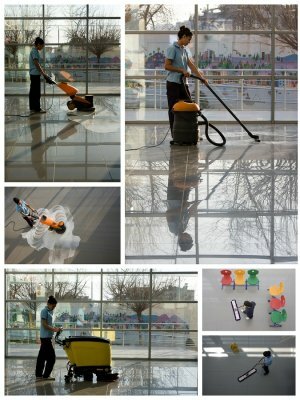 Hiring a residential cleaning service is a great way to give your floors the treatment they need. The bathroom is one of the most commonly used rooms in the house. It can also become one of the dirtiest rooms in the house if you do not keep up with regular chores. With all of the moisture inside of the bathroom, it is easy for bacteria and mold to start growing. These and other germs in the bathroom can make the room look bad and negatively impact your family’s health. House cleaning professionals can help you with bathroom cleaning and disinfecting responsibilities, letting your family enjoy a clean and healthy bathroom every day. How often do you clean your refrigerator? What about the oven? We use a lot of home appliances on a regular basis, but we do not always clean these appliances on a regular basis! Leftover food and other debris can build up in your kitchen appliances, leading to bacteria growth and increasing your risk of a pest control problem. If you hire a weekly maid service, you can let the professionals handle your appliances and put your worries about bacteria and pests on the backburner.